University accommodation in Edinburgh between June and mid August. The university has accommodation over several different developments in Edinburgh, most of which are within a ten minute walk to Princes Street. All flats are within easy reach of Edinburgh's main shopping thoroughfare, tourist attractions, cinemas, restaurants and other amenities. 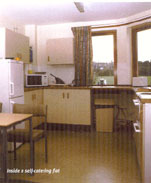 The developments are purpose built, modern accommodation blocks. The developments consist of flats that can accommodate 4 and 5 persons. Wright's Houses also has 3 person flats. All the flats have single rooms, communal dining/living area and shower room. Parking is available at two locations, however, particularly in August it is extremely limited and based on a first come first served basis. Unfortunately, the university cannot guarantee spaces. Site superintendents to welcome and assist visitors. Bedlinen supplied at a small extra charge. Bedlinen included in Mini Breaks prices. high chairs can be supplied if booked in advance. A number of the apartments have been specially adapted for the disabled with extra space for movement, lowered sinks and drive in shower for wheelchair users. Disabled parking places are also provided.